World in Motion: The Wonders of Rum! Good Monday!! Hopefully everyone had a great weekend full of make-up, wigs, itchy fabric and lots of booze! But yes, sadly the weekend is over and I've decided to lighten the load of the oncoming week with some mischevious humor. 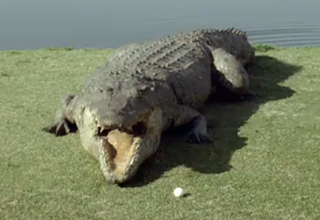 I had to choose between 3 great ads for today but given the weekend festivities I chose this ad for Bundaberg Rum which features a crocodile, a couple of golfers and a lethal tee. It is very amusing, a little absurd and lighthearted fun so it will get the blood pumping throughout your body and into your brain where it is much needed to get the hamster running on its wheel... Check it out below! I'll dig deeper into this thought throughout the week, for now enjoy the video and leave a comment, I'd like to get your thoughts on it.